U.S. cosmetics laws remain largely unchanged since the Great Depression! What’s even more depressing is that Congress has left it up to consumers to find out about harmful chemicals in their personal products. Join Modere along with EWG, Kourtney Kardashian and many more in taking a stand in the fight for cosmetics reform. For more than 30 years, Modere has been committed to earning your trust with products that consistently deliver. Products that set a new standard for performance, formulated with ingredients you can feel good about bringing into your home. We’ve made a conscious choice to eliminate unnecessary and potentially harmful ingredients commonly found in conventional formulations, because what we leave out is as important as what we include. 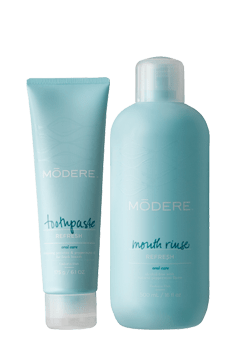 The Modere Fresh Breath Collection is the world’s first EWG Verified™ oral care line. Our Toothpaste and Mouth Rinse work together to keep your mouth clean, fresh and healthy every day. All products bearing the EWG Verified mark meet rigorous criteria for compliance with strict ingredient standards, good manufacturing practices and full labeling transparency. Check out our EWG ratings for our Toothpaste and Mouth Rinse and join with us, the EWG and Kourtney Kardashian in supporting cosmetics reform. Keep your mouth in fresh, mint condition with the Fresh Breath Collection, featuring the world’s first-ever EWG Verified™ Toothpaste and Mouth Rinse!